The first volume of Showcase Presents: The Flash came out today, reprinting ~500 pages of Silver-Age Flash stories in black-and-white for cheap. If you’re familiar with Marvel’s Essential line, it’s the same concept. I took a look at it to see what stories were included. (DC’s solicits didn’t say.) 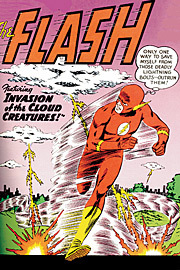 As expected, it features the first several years of Barry Allen’s run as the Flash, from the original Showcase appearances starting in 1956 through the beginning of his series in 1959–1961. That includes the first appearances of the Elongated Man (who got his own Showcase Presents book last year) and Wally West as Kid Flash. There was one surprise: “The Rival Flash,” from Flash Comics #104 (1949). That was the final issue of the Golden-Age series, and the last solo Jay Garrick adventure printed for years. I’d heard that the Showcase Presents books were making use of restoration done for DC’s Archives series, and this tracks: That same story also appeared in The Flash Archives Volume #1. It also appears as a backup in The Flash #211 (1971), and is listed in the contents for the upcoming Flash: The Greatest Stories Ever Told, tying the origin story in Flash Comics #1 for the most-reprinted Golden-Age Flash story yet. This entry was posted in Comics and tagged DC, Flash, Showcase, Silver Age on May 16, 2007 by Kelson.